The site "Numbio" World, which means the standard of living of the world, that the expenses of Iraqi citizens to the markets accounted for nearly one third of his monthly salary. The site, according to the latest update in February 2019, that "the markets that include basic food for the citizen accounted for 31.2% of the monthly expenses of the Iraqi citizen," noting that "bread, local cheese, potatoes, tomatoes and canned water is the most important food needed in the market." 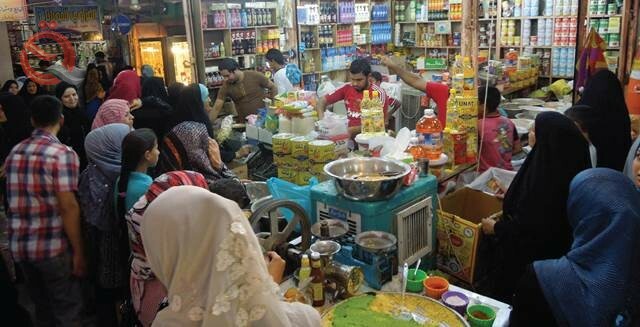 He added that "the rent came in second place of the monthly expenditure of the citizen and by 21.7%, while restaurants ranked third in the expenses of the Iraqi citizen and by 14%," noting that "a meal for two people in one of the average restaurants in Baghdad cost $ 30. The site pointed out that "the means of transport came at 11.2% of the expenditure of the monthly Iraqi citizen," explaining that "taxi fare for a distance of 1 km is 2.52 dollars, and taxi fare for an hour of 10 dollars." "The Iraqi citizen spends on the basic services of electricity, heating, cooling, water, garbage and 9.9%, followed by sports and leisure expenses came at 9%," he said. "The monthly fee per person to participate in the club is $ 40.45, The price of renting a stadium the size of the tennis court for an hour amounted to 23.56 dollars. " "The Iraqi citizen spends only 2.8 percent on clothes and shoes," the website said. "The price of a pair of jeans is $ 35.17, while the price of a pair of shoes for businessmen is $ 53.66." Numbeo is one of the sites launched in 2009 and is considered a source by many international newspapers and magazines, including BBC, Time, The Forks, Forbes, The The New York Times, The Telegraph, The Edge, The Sydney Morning Herald, China Daily, The Washington Post, The United States Today, "dozens of sites and other media.